I talked with a friend today about this week’s gospel lesson, the story of the death and raising of Lazarus. At my church we’ll see it presented as a drama. My friend mentioned that the story is about grief, which it is, but then we began to think of other things it’s about, which is funny work to be doing when I’m not preaching at all. It’s about a family’s terrible loss. It’s about the fears of the disciples. It’s about the future “Doubting” Thomas offering to go anywhere with Jesus. It’s about Martha, and more to the point, someone other than Peter saying who Jesus is: the Messiah, the Son of God. It’s about politics, in the sense that there will be repercussions with the authorities, for Jesus *and* Lazarus. It’s about a miracle, a thing that cannot possibly true, but is. And, yes, it’s about grief, God’s human grief, but it never lets us forget he’s not just human, does it? Most of us can’t change things just because we’re sad. So, why is Jesus crying? He knows he’s going to bring Lazarus back, right? Is it because he had to put his friend through death to prove his power? Are they tears of regret? Or is it a sadness that he can’t bring things to a head without a move so drastic and dramatic? I love this story, for Martha’s bluntness and Mary’s emotion, and the turmoil of the disciples. I also love it for the astonishment of a dead person rising to answer the call of Jesus. I’m not a literalist about anything in the Bible, but usually by the time the Fifth Sunday of Lent rolls around in Year A, I’m willing to believe Lazarus died and Jesus called him out of the tomb to live again. Maybe it calls to things that have been entombed in me, waiting to come out like Lazarus. I can’t explain it rationally. I simply feel it, perhaps because the family feels so real to me that I could weep with them, too. Like Jesus. I love your musings on this story. I too love it, for myriad reasons, though I am struggling to write using these texts about life and death (I'm using Ezekiel); I think part of it is that I can't see the resurrection in my own situation just yet. 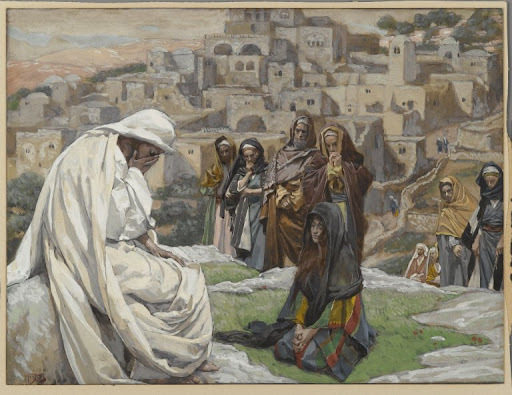 It's also about the role of women – in their society, Martha and Mary had no business to be rushing out to Jesus; they were supposed to be "sitting shiva" on low stools and allowing people to come to _them_. But even Martha, by then, had known Jesus long enough to know that the unconventional was acceptable…. Mags, that's a hard place to be.Mrs. Redboots, great point. Thanks. I'm preaching the Ezekiel passage, too, @Magdalene6127. I'm thinking of focusing on Ezekiel as the conduit of the life and the breath. Asking, "how will resurrection come, if not through us?" hmmm…I love what you say about being entombed….and the hope of resurrection!